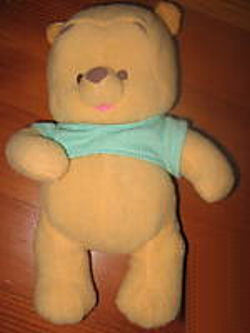 I’m looking for a toy stuffed Winnie the Pooh from the Pooh Baby line. It may have been from Fisher Price or Mattel. It is plush with a soft rattle inside, and it’s approximately 10″ tall. The one I’d really like to find would be wearing a pale green (or aqua green) shirt. I got the toy new in early 2005, so it would be from the 2004/2005 time range. Ours was lost…possibly in North Carolina in November 2008. We lost this toy while traveling. It is a favorite of my son’s, and we would love to replace it. I would very much like to find a new or very gently used one.